The Oscars red carpet this year remained focused on fashion, and continued its apolitical stance with small nods to social issues. New York: The world’s most important fashion show hit the red carpet Sunday at the 91st Academy Awards, as designer labels vied for attention-grabbing moments in the walkup to an unusual, host-less Oscars—replete with new rules aimed at reversing a drop in viewership. Last year, the Oscars strove to stay apolitical, and this year was no different. The pre-game show remained the usual gauntlet of sartorial excess sprinkled with small nods to social consciousness. In 2018, #MeToo was on everyone’s lips as the movement swept over Hollywood like a tsunami. This year, demands for gender equity and nominee diversity were prominent beforehand, but on the catwalk there was little more than the American Civil Liberties Union ribbon worn by Constance Wu. 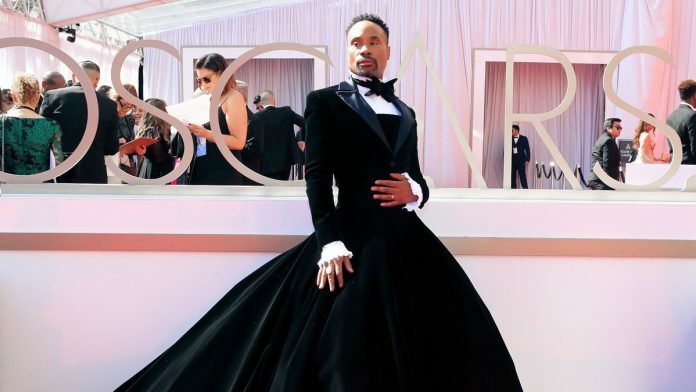 If anything, it was Christian Siriano’s black velvet tuxedo-gown, as worn by actor and singer Billy Porter, that did double-duty as design of the night and political statement. Others lauded by the fashion critics, both professional and amateur, included the aforementioned Wu wearing a yellow chiffon dress from Versace, Emilia Clarke of Game of Thrones in a shimmering light purple Balmain gown and Laura Harrier sporting a pastel blue number by Louis Vuitton. When it came to fashion trends, this year the red carpet was full of pink—from a vivacious fuchsia dress worn by Gemma Chan to Jason Momoa’s light blush tux. There’s a lot of money at stake during awards season. These events serve as a major platform for design houses to show off their clothes, since the red carpet can cement credibility that lasts all year long. Outfitting an A-list celebrity—and making them look good—can mean a breakthrough for a young designer. For the big labels, such as Valentino and Armani, it’s almost expected of them to stay relevant with new creations. The impact of red carpet style is seen almost immediately after the Oscars—not just in dress sales but in the copycat market as well. Trademark spats pile up fast as cheap dressmakers scramble to sell versions of the most talked-about looks for those who can’t afford the real thing. For a century or more, celebrities have had an intimate relationship with the fashion industrial complex. These days, even B-listers and below get to dress up in $5,000 gowns and $100,000 necklaces free of charge. Meanwhile, the true superstars work out deals where they become some of the highest paid runway models in the world, if only for one night. From dresses to jewellery to makeup—no opportunity is missed. Lots of celebrities are already paid millions of dollars to be spokesmodels for big fashion labels—and they, of course, stick with their brand on the big day. Last year, this symbiotic relationship was set aside for two of the shows—the Golden Globes and the BAFTA Awards. The customary fashion show was sidelined to make a statement against sexual misconduct. Hollywood’s biggest stars all wore black in solidarity with #MeToo. At the Oscars, however, it was mostly business as usual. As usual.